Yes, that is a sheet of toilet paper, with one series outlined in pencil so you can see the design more clearly. Now time to get back to a super secret project that I’ve been putting off for far too long. When I finally get to share it, you’ll be blown away! I like that design. I could see it with scrappy strips (maybe sort of monochromatic in each section) with a white background. That is fancy toilet paper! You have a good eye for inspiration in unlikely places. That would make a lovely quilting pattern! 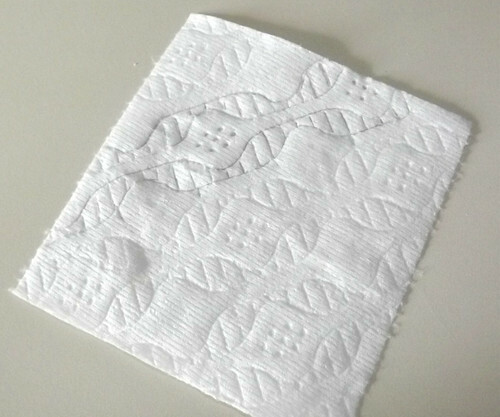 I see I’m not the only one that looks at toilet paper and paper towel for quilting designs. (What else are you going to do while you’re in there?) Thanks for my smile of the day. Some things maybe aren’t meant to be shared. I like to think of toilet paper as a single-use item. But hey, thanks for the cool link to the patchwork pattern maker! I make very detailed, photographic picture quilts (using Wonder Under and a collage technique and then quilting, not piecing) but this gives another nice quality to the same idea.